It defines the trade contract responsibilities and liabilities between buyer and seller. It is invaluable and cost-saving tool. The exporter and the importer need not undergo a lengthy negotiation about the conditions of each transaction. F SIGNIFIES THAT THE SELLER MUST HAND OVER THE GOOD TO A NOMINATED CARRIER FREE OF RISK AND EXPENSE TO THE BUYER. SELLER ARRANGES PRE-CARRIAGE TO REACH AND AGREED POINT FOR HANDLING THE GOODS OVER TO THE CARRIER. C SIGNIFIES THAT THE SELLER MUST BEAR CERTAIN COSTS EVEN AFTER THE CRITICAL POINT FOR THE DIVERSION OF THE RISK OF LOSS OR DAMAGE TO THE GOODS HAS BEEN REACHED. D SIGNIFIES THAT THE GOODS MUST ARRIVE AT STATED DESTINATION. Applies to goods available only at the seller’s premises. Buyer is responsible for loading the goods on truck or container at the seller’s premises, and for the subsequent costs and risks. seller delivers the goods, cleared for export, to the carrier nominated by the buyer at the named place. Seller pays for carriage to the named place. Buyer is responsible for the main carriage/freight, cargo insurance and other costs and risks. seller delivers when the goods are placed alongside the vessel at the named port of shipment. The seller is required to clear the goods for export.? The buyer has to bear all costs and risks of loss or damage to the goods from that moment. seller delivers when the goods pass the ship’s rail at the named port of shipment. This meansthe buyer has to bear all costs and risks to the goods from that point. The seller must clear the goods for export. If the parties do not intend to deliver the goods across the ship’s rail than FCA rule should be used. seller delivers when the goods pass the ship’s rail in port of shipment. Seller must pay the costs and freight necessary to bring the goods to the named port of destination, BUT therisks of loss or damage, as well as any additional costs due to events occurring after the time of delivery, are transferred from seller to buyer. Seller must clear goods for export. The seller delivers when the goods pass the ship’s rail in the port of shipment. Seller must pay the cost and freight necessary to bring goods to named port of destination. Risk of loss and damage are the same as CFR. 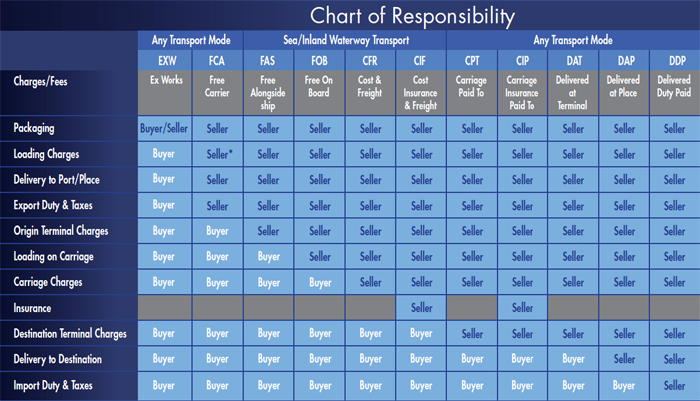 Seller also has to procure marine insurance against buyer’s risk of loss/damage during the carriage.? Seller must clear the goods for export. Seller delivers the goods to the carrier nominated by him but the seller must in addition pay the cost of carriage necessary to bring the goods to the named destination. The buyer bearsall costs occurring after the goods have been so delivered. The seller must clear the goods for export. The delivery of goods and the cargo insurance to the named place of destination (discharge) at seller’s expense. Buyer assumes the import customs clearance, payment of customs duties and taxes, and other costs and risks. seller delivers when the goods once unladed from the arriving means of transport, are placed at the disposal of the buyer at a named terminal at?a named port or place of destination. "Terminal"?includes any place, whether covered or not, such as a quay, warehouse, container yard or road, rail or air cargo terminal.? The seller bears all risks involved in bringing the goods to and unloading them at terminal at the named port or place of destination. seller delivers when the goods are placed at the disposal of the buyer on the arriving means of carriage ready for unloading at the names place of destination. The seller bears all risks involved in bring the goods to the named place however, shipper is not responsible for custom formalities. This term represents maximum obligation to the seller. This term should not be used if the seller is unable to directly or indirectly obtain the import license. This term means the same as the DAP term with the exception that the seller also will bear all costs and risks of carrying out customs formalities including the payment of duties, taxes and customs fees. © 2019 IMPEX GLS. All rights reserved.